At the heart of the gymnasium’s new system is an Ashly Pema 8250 combined eight-input Protea matrix processor and eight-channel, 250W-per-channel network amplifier. Half Moon Bay is an idyllic beach town just 45 minutes south of San Francisco, and its children attend schools administered by the Cabrillo Unified School District. Recently, the district joined forces with the area Boys and Girls Club to fund construction of a state-of-the-art, 18,000-square-foot gymnasium for use by both Cunha Intermediate School and the community generally as a performance and meeting space. Local AV engineering and integration firm Performance Media Industries (PMI) designed and installed the gym’s new, highly musical, highly intelligible sound reinforcement system. By using Ashly Audio’s Pema 8250 DSP matrix processor/eight-channel amplifier, two ne8250 amplifiers, an nXp1.54 4-channel amplifier, an FR-8 custom-configurable remote fader bank, and custom iPad user control software, along with Klipsch loudspeakers and subwoofers, PMI gave Half Moon Bay a high-fidelity system with rock-solid reliability for almost half of what it would have otherwise cost, according to the firm. Despite the high expectations, the budget was tight and space for rack equipment was limited—just a 22 RU in a small closet—and user control had to be intuitive. At the heart of the system is an Ashly Pema 8250 combined eight-input Protea matrix processor and eight-channel, 250W-per-channel network amplifier. Two Ashly ne8250 multichannel, network-enabled amplifiers deliver an additional 16 channels at 250W per channel. An nXp 1.54 amplifier rounds out the package to power up the eight subwoofers with 1,500 watts per pair. Inputs to the system include a Shure wireless microphone system with four separate microphones and receivers, a Denon multimedia player (e.g. CD, radio, various digital files), and a 1/8-inch jack for phones and the like. The retractable bleachers extend out on all four sides of the court, necessitating coverage broken into six zones: northwest, north, northeast, southeast, south, and southwest. Each zone focuses on a particular area of the bleachers and allows each zone to operate autonomously when the curtains subdivide the room. 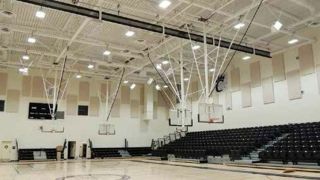 Flown Klipsch KI-262 and KI-362 full-range loudspeakers join Klipsch K I-115 subwoofers at a height that’s safe from errant basketballs, but low enough to minimize energy spilled in the room relative to direct coverage of the bleachers. In all, there are 42 loudspeakers and subwoofers, a fact that allows the system as a whole to put out considerable SPL without causing any single box to sweat. A network of 48-by-96-by-2-inch sound absorber panels line the walls and the ceiling is made of a corrugated perforated metal scheme that conceals three-inch deep rock wool insulation. The acoustical package brings the reverberation time of the room down to about one second, for good voice intelligibility and musical clarity.